This NIMBY declares her love for the West Bank. I’m here to tell you I bought a brand new couch, I got an amazing deal on it and I got it on the West Bank. The “West Bank” is actually the south side of the Mississippi River, when looking at a map of the New Orleans. However, in much of the country, the river does run north/south and divides the US into eastern and western halves. It’s a little confusing, especially because some parts of the “West Bank” lie east of the parts across the river. People make fun of the the West Bank, so I assumed it was a generic suburb without the charm of the Crescent City. I had only been over there a few times when I lived here before–to go to an eye doctor and immediately return to New Orleans. But my boyfriend and I were in need of a couch, so when a friend* tipped me off about a Rooms to Go outlet there, we drove across the bridge. Guys, THEY HAVE EVERYTHING OVER THERE. After buying the couch, we took it home in a truck we rented (by the hour) from the Home Depot directly next to the store. Additionally, this Rooms to Go is in a shopping center with a number of discount stores. 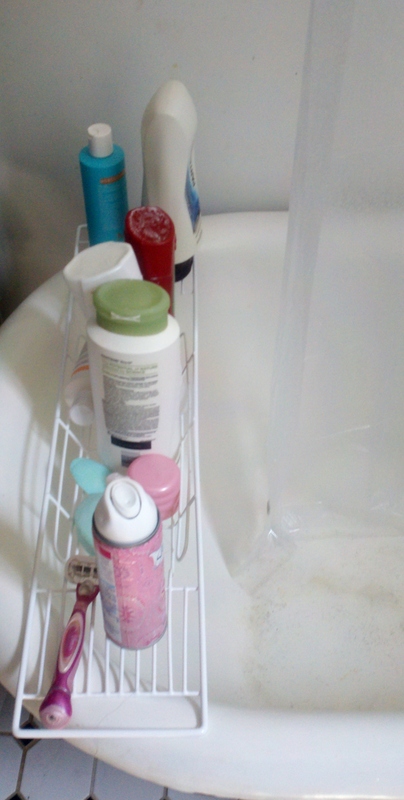 We were able to find storage for our clawfoot tub for $7– previously we had found options that started at $40! The next day we returned to the West Bank to go to Target and tacked on a trip to Michaels and World Market. I know many of these options are available in Metarie, but everything on the West Bank is so close together. Plus you get amazing view of New Orleans! 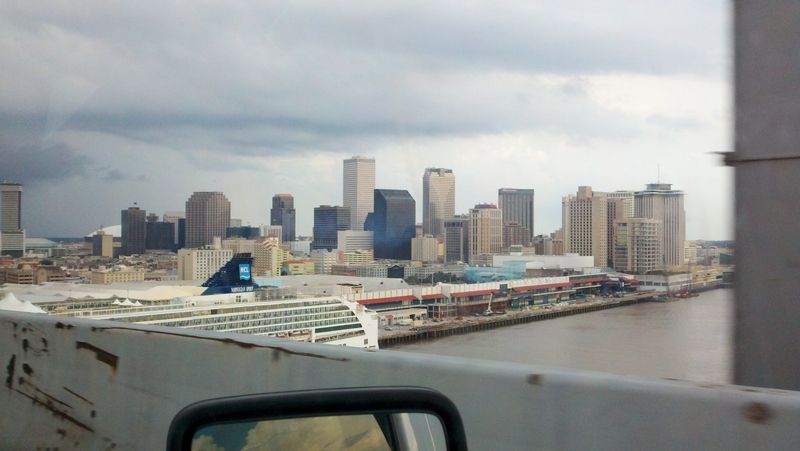 Views of New Orleans, coming over the bridge. I’ve said before that I get really turned off when big box stores permeate an area and erase a sense of place from the landscape. However, I take for granted that these chains benefit lots of communities. And I love shopping at them too. As we drove past large discount retailers (Ross, I’ll see you soon!) I grinned in delight. Our shotgun house still needs a lot of things, and it seems that I can find them all on the West Bank, at great prices! 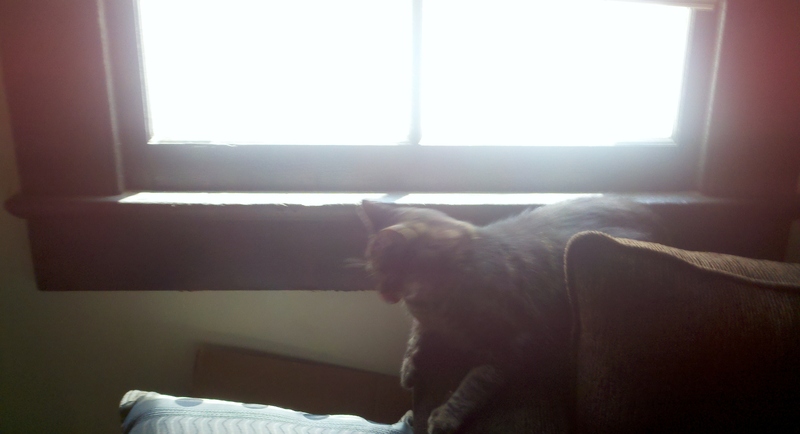 Santi the cat enjoys the couch. I appreciate New Orleans’ plethora of local businesses. Even though there are chains–Walmart, Home Depot and Lowes come to mind–independent retail is another aspect of the city that makes it unique. Having a car and living within a short drive of big box stores has made life easier. It was a challenge outfitting my apartment when I first moved to D.C. Eventually a Target opened near a metro line in the city– but it was packed to the gills and was still difficult to transport large items by hand. I feel lucky to live in New Orleans, a place with so much personality. I turn my nose at the ubiquity of hains, but of course don’t mind if they’re confined to the suburbs. I mean, who could object to something like an Old Navy? Y’know, just to pick up a few pairs of shorts at a great price. *The same friend told me there’s a Hong Kong Market over there… HOLY HELL. See you soon, West Bank.